» Carbon, nitrogen and phosphorus content in the seasonally thawed soils are described for four arctic tundra vegetation types located near the Toolik Field Station, Arctic LTER 1993. Soil cores were taken from Toolik Lake LTER Tussock Tundra, Wet Sedge Tundra, Shrub Tundra and Heath sites on August 6and7 1993. All cores were taken in the control plots within each block. 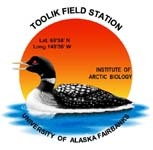 See Notes and Comments for how samples were processed in the field and at the Toolik field lab. Carbon and nitrogen concentrations were measured using a Perkin-Elmer CHN elemental analyzer. Total P was measured on ashed samples leached with HCl (Aspila, et al 1976). Notes: TUSSOCK TUNDRA Field: We took 5 samples from 1 control plot in each of the 4 blocks located ca. .5km south of Toolik Lake. Cores (64 mm diameter, 32.17 cm2) were taken at random locations along a 5m tape laid out parallel to and within 1 m of the north boundary line of each plot. Total core depths (to permafrost or rock) and O horizon (Oiea) were recorded. Lab: Organic horizons were sometimes separated into subhorizons and sometimes not. Analyze as they were separated for moisture content, dry mass/m2, %C and %N. We can then calculate C and N per m2 from masses and percent C and N, summing values for subhorizons when necessary. Mineral soils (when present) should be treated in aggregate. Field: We took 5 cores each from control plots in Block l (near Toolik Lake inlet stream on south side of lake) and in Block 3 and 4 (near the outlet stream north of Toolik Lake and the old airstrip). Cores (64 mm diam.) were taken at random locations along the 5m northern boundary of each plot. All cores were taken to permafrost unless noted in lab book. Core depths were recorded during core extraction by subtracting the length of the corer above the soil surface from the total corer length. NOTE that the plot block #4 was wetter than the other control plots. Lab: Cores were difficult to separate by horizon, often appearing uniform except for narrow bands at the top and bottom. Most cores were divided into 3 equal lengths for analysis. Some cores from block #4 were divided into only 2 (or not divided) length because of the high water content and low dry mass. Field: We took 5 samples from random locations along the North boundary of control plots in block 1 (East of old pipeline camp) and block 2 (near North end of Toolik Lake). Cores were taken to permafrost or rock and were shallower in Block 2. Organic horizon depths were determined in the field by subtracting mineral soil thickness (where present) from total core length. Lab: Organic subhorizons were easier to distinguish here than in other sites. Samples were treated similarly to Tussock Tundra soils. Field: We sampled 3 rectangular samples of O horizon from 3 random points along a 5m line located parallel to and near the south boundary of one control plot in each of 3 blocks. Samples were taken using a 16cm*25cm plywood template (400cm2). We also sampled mineral soils (no bulk densities) by taking rock-free grab samples from the 5cm of mineral soil below the O horizon samples. NOTE- soils were rocky but organic mats (O horizons) were always present ranging from 1 to 4cm thick. We recorded O horizon thicknesses at the midpoint of each side of the hole left when the rectangular samples were removed. Lab: We removed live vegetation, large roots and rhizomes and passed O horizons through 1/2 inch hardware cloth and weighed the entire 400 cm2. A subsample was then weighed for fresh weight/dry weight determination. After drying, these samples will be used for %C, %N analyses. Calculations: NOTE: All missing values are indicated by a N/A. Bulk Density: The organic or mineral layer dry weights were added together for each core and divided by the volume of the layer. The volume for the Heath site is (400 cm2*soil dry wt.) whereas the rest of the sites are (3.14*soil dry wt. *(3.2 cm)^2) where 3.14 is Pi and 3.2 is the radius of the corer. All the O and B horizons were then averaged for each site. Grams per meter square: The mass for each horizon was add together in each core and then divided by the area of the core. Heath - .04 m^2 and all others - .0032 m^2. Reference Citations: Aspila, K.I. Aspila, H. Agemian and A.S.Y. Chau. 1976 A semi-automated method for the determination of inorganic and total phosphate in sediments. Analyst, 101:187-197. Version 6: Updated units to current startards. Fixed discrepency with header variable names. Updated metadata form to newer version (without site sheet). CH 24 Jan 2013. Updated to newer metadata with site sheet. CH March 2013. Definition: Average depth of horizon. Definition: Average bulk density of each horizon. Definition: Notes on individual data points.